VANCOUVER — Keylyn Filewich may have introduced herself to the Canada West with a breakout campaign last season that was big on tried-and-true low post moves. Yet while the UBC Thunderbirds’ 6-foot-2 post had plenty to be proud of coming off her first season as a full-time Canada West starter, posting per-game averages of 16.6 points and 8.8 rebounds to go along with 57 per cent shooting from the field, her defining calling card might be less about the numbers and more about the way she chooses to respond to success. Now, as the Thunderbirds (12-4) prepare to close out the home portion of their 2018-19 conference season by hosting Prince George’s UNBC Timberwolves (9-7) on Friday (1 p.m.) and Saturday (5 p.m.) at War Gym, it’s evident for all to see that the Vincent Massey Collegiate grad had no intention of ever resting on her laurels. If she thought she was methodical, she has certainly shed that moniker this season. 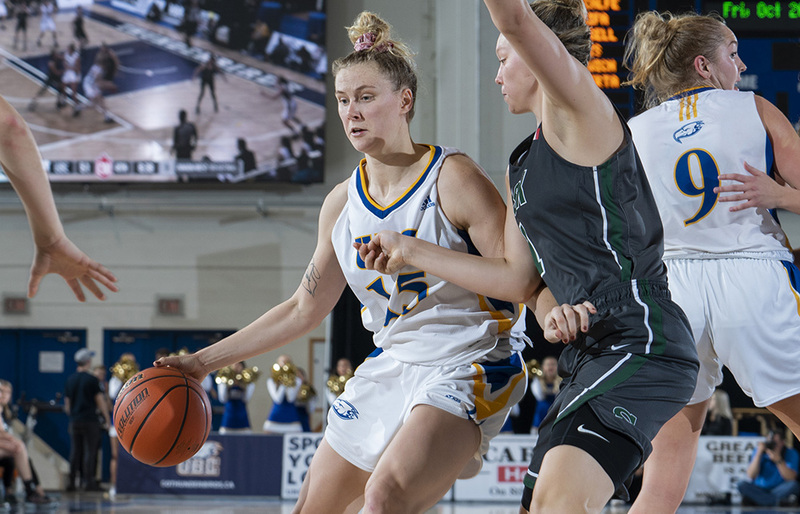 Sixteen games into her 20-game regular season conference schedule, Filewich has thus far fashioned UBC’s most productive single-season UBC rebounding campaign since the Canada West formed and began keeping records in 1972-73. Through 16 games, Filewich is averaging not only 18.1 points per game, but 10.8 rebounds per game. 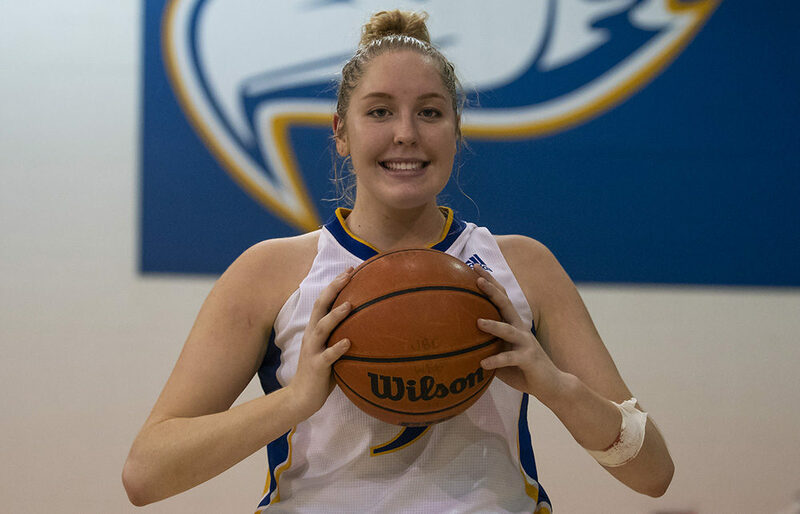 The latter total, with four games remaining, is higher than the five previous double-digit rebounding seasons in UBC women’s history, including the record 10.7 rebounds-per-game collected by Cheryl Kinton over the 1991-92 season. Back in UBC’s 2005-06 Bronze Baby CIS national championship season, fourth-year forward Kelsey Blair had 200 rebounds in 20 games for a perfect 10.0 average. In 2007-08, one year after they had won a third national title, forward Leanne Evans finished with 10.3 rebounds per game. The other two, both from the 1970s: Margot McCullough’s 10.1 in 1977-78, and Agnes Baker’s 10.0 in 1979-80. Yet in a most amazing season of rebounding excellence, there’s more. While Filewich has gained rebounding acclaim for her work on the offensive glass, fourth-year guard Maddison Penn has been equally magnificent and could well, over the final four games of the regular season, set the rebounding record herself. Not only has Penn averaged 16.2 points per game, she has averaged 10.6 rebounds per game with her speciality in collecting rebounds off the defensive glass. At no time over UBC’s entire Canada West tenure has the team ever had two double-digit rebounders in the same season, says UBC sports information director Wilson Wong. At the start of the season, with their overall power as a rebounding team becoming very apparent, Filewich remembers the bar being set very high. Heading into this weekend, UBC is right there, sitting second in Canada West at 51.4 rebounds per game. Yet a more telling stat is the team’s rebounding differential, or the difference in their own rebounds versus that of their opposition. Last season, UBC was fourth in Canada West at plus-4. This season, they’re a couple of spots higher at second, yet their differential is an impressive plus-14.3. This weekend, the ‘Birds will also face a very impressive rebounder in UNBC’s Vasiliki Louka, who not only leads the conference in rebounding at 12.4 per game, but adds 17.4 points-per-game to boot. 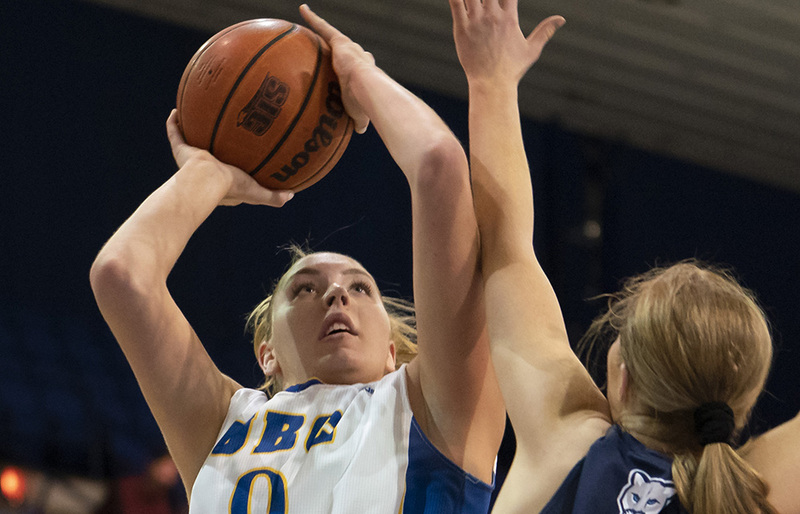 For UBC head coach Deb Huband, now in her 24th season at the helm, the key is not to have her other players simply watch the top rebounders go to work, but to have them join in and make it a part of the team’s DNA. Maximizing the Filewich-Penn partnership is an ongoing process, and Huband needs only look back at her best teams, three of which won Bronze Baby national titles, to know that having a duo of double-figure rebounders is a luxury that can’t be taken for granted. It was a simple plan with incredible results. Filewich has reached double figures in offence in every game this season, 22 and counting heading into Friday. She has broken 20 points eight times and 30 points twice, including 32 in 30 minutes a few weeks ago in a win over UBC Okanagan. And early in the Canada West season, she set a program record with 27 rebounds in a triple OT win over Victoria. Yet while we referenced earlier just how determined Filewich was to not let her game stagnate, Huband is of the same mind, challenging her post to more fully embrace her on-court influence as it pertains to the other four players wearing blue and gold. But Keylyn Filewich is also embracing UBC women’s basketball history and the traditions it carries. “I haven’t met Kelsey, but I have heard a lot about her,” Filewich begins of Blair (2002-07), who led UBC in rebounding every year she played with the team and won national titles in 2004 and 2006.